In order to cultivate individual's interest in global awareness, our vision is to promote a multinational summary of the foundation's ideals and intentions in the field of international exchange. In order to deepen city residents' understanding about our international exchange program, we are working hard at public awareness activities. By holding lectures, etc., we are creating opportunities for city residents to deepen their international understanding. We welcome lecturers who lived and had action in other countries. At the foundation we hold discussions and lectures about the state of various countries. We aim for a deeper understanding of international affairs, as well as the history and customs of various countries. 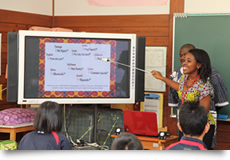 We act as a preliminary step to students studying English in school. Our aim here is to remove the fear of learning English from students by providing a fun and interactive way to introduce them to the language. Each course (15 student capacity), classes are held 7 times a year. 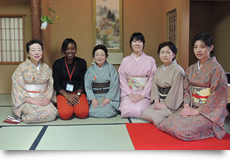 We strive to help foreign residents lead comfortable lives in Japan through supporting them in learning the Japanese language, etc. In addition to our Japanese language volunteers (whom we call “pongo”) providing support in language learning, we act as a bridge between our local and foreign residents. By working together with international organizations, we have connected with people from around the world. 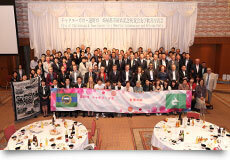 We are expecting our city to have an increase of visitors from other countries due to the Olympics being held in Tokyo. In fact, Kitakami Highlands in Iwate is being considered for the International Linear Collider (ILC). Also in Iwate, Kamaishi city will host the Rugby World Cup in 2019, and Hiraizumi has been chosen to host the World Heritage Site. To further introduce our multinational visitors to a variety of culture and traditions in Japan, and specifically in Tono, we created the Cultural Experience Project in 2014. To evaluate its potential we performed a trial run from October 22—November 30, 2014. The projects aim was to provide an opportunity for the residents of Tono to interact with the multinational visitors in a fun and enjoyable environment. During the trial period there were 12 meetings. There were sixteen (16) international visitors from four (4) different countries. 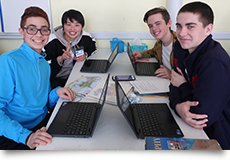 Based on their experiences we found that they were extremely receptive and interested in better understanding Japanese culture and the nature of Japanese people. This project is supported by various groups within the city, and is being offered through their cooperation. With a look towards for full-time implementation, we are holding it again for another trial period in 2015. We are looking into the needs of the community and expanding the program, etc., in order to create an even better program. We are running an international exchange program that sends middle school students from Tono to Chattanooga City, Tennessee, U.S.A. This program gives students the experience of a homestay in America. The program itself aims to immerse students in an international--English speaking environment giving them global experience and awareness, while cultivating their international competence. The film “The Legends of Tono” (directed by Murano Tetsutaro), which Iwate Broadcasting Co., Ltd., made as a commemoration for its 30th anniversary since its founding, was awarding the grand prize at the 35th Salerno International Film Festival. Albert Croucha, the mayor of Salerno, saw the film and entrusted a letter to Murano Tetsutaro proposing that Salerno and Tono become sister cities. 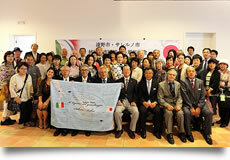 On August 8, 1984, the to cities began their cooperation together officially as sister cities. 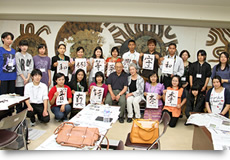 At our foundation, we have an office that handles official visits and citizen exchanges. After when Tono High school and Tono Ryokuho High school signed a sister schools with CSAS(Chattanooga School for the Arts and Sciences) in 1990, approximately 600 High school and Junior High school students and citizens visited Chattanooga and deepened their friendship. And that led the signing of sister cities in September 15,2017.